The Festival Biennial of Animation Bratislava (BAB) has earned a special place on the map of international festivals due to its focusing exclusively on animation intended for children. In 1991, it achieved the status of international festival and has cooperated with international organization of UNICEF since its very beginning. The Festival’s mission is to foster artistic confrontation in the field of animation intended for children, create conditions for the evaluation thereof and hence support the complex development of this unique kind of art. The international competition of animated films for children is unique, since it reflects the non-commercial audio-visual culture as well as animated films from all over the world, just like the one which has been presented by the BIB for half a century of universal book illustrations for children. … but above all, it is about fairy tales, fairy tales and once again FAIRY TALES! One part of BAB introduces retrospective screenings of films, profile displays of the filmmakers and presentations of important personalities from the field of animated film as well as thematic film screenings and international expert seminars focused on the questions relating to the relationship between illustration and animation. BAB Festival awards Prix Klingsor – Lifetime Achievement Award that goes to the excellent personalities active in European and international animated film. Its awardees are Emanuele Luzzati, Giulio Gianini, Frédéric Back, Faith Hubley, Gene Deitch, Co Hoedeman, Břetislav Pojar, Caroline Leaf, Michel Ocelot, Marcell Jankovics, Garri Bardin, Witold Gierz and in 2016, it was Jannik Hastrup. The festival awards the Albín Brunovský Honorary Medal for an outstanding artistic graphic and professional contribution to the field of animated film. In 2016, the awardees were Tadeusz Wilkosz - artist, animator and director (Poland), Jiří Kubíček - screenwriter, dramaturge and educator (Czech Republic), Vladimír Malík - artist, animator, director and educator (Slovakia) and John Halas (in Memoriam) - artist, animator and director (United Kingdom). The international competition gives the viewers the opportunity to see the latest animated films for children from all over the world. The international jury awards not only the first prize - Viktor Kubal Prize for Best Film, but also some other prizes - UNICEF Award and Visegrad Prize-St. Vojtech Prize. Children viewers also cast their vote at the festival - Children´s Audience Award. In 2018, BAB will visit different towns in Slovakia. Competitive screenings and selected collections of film programmes will be introduced in the regions. Children viewers can see the screenings taking part in the competion not only in the cinemas in Bratislava, but also in Košice, Prešov, Prievidza and Myjava. Screenings not taking part in the competition will take place in the cinemas Mladost and Klap at the Film and Television Faculty at the Academy of Performing Arts in Bratislava and they will introduce not only the best works coming from the European film studios, retrospective screenings of works made by the personalities coming from the field of Slovak animation, world-known legends of animated film, but they will also give the opportunity to meet the filmmakers of the screened films in person. The programme also enables to see animated films made by children in the workshop Animation – School at Play – Come and Play with Film that are led by recognizable leaders. BAB 2018 announces already the fourth Flipbook Contest for children everywhere in Slovakia. Its goal is to awake children´s interest in animation and support their creative activity. Screenings of the winning films at the Emile Awards and the film marathon screening the best films Best of Annecy will be one part of the festival. 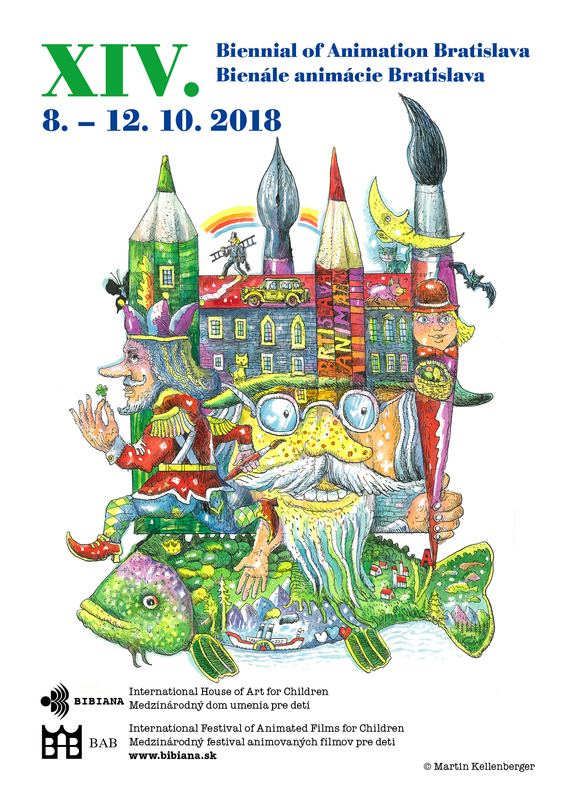 In addition to special activities, meetings with the filmmakers and exhibitions in BIBIANA and in other foreign cultural institutes, already the second year of the International BAB Forum in cooperation with the Prešov University will take place and as a video conference it will be devoted to the theme of the relationship between Animation and Illustration. The Festival is organised by BIBIANA, International House of Art for Children. BEWARE - DEPOSIT OF STORIES!